As always, summer has gone quickly – the Indiana State Fair is in full swing and our Fall semester is just around the corner. There's no overarching theme to this month’s column, just some observations and reflections as we start the new academic year. We just wrapped up the New Faculty Tour and I am very, very excited about our newest colleagues. You will meet them very soon in our new faculty issue of InFocus. Biochemists and econometricians, animal well-being and agricultural communications experts – and more. We have some terrific new faculty joining our College. The New Faculty Tour was another reminder of how your work impacts this state and nation: to hear leaders such as Sonny Beck, President of Beck’s Hybrids; Don Villwock, President of Indiana Farm Bureau; Tom Rooney of Tuttle Orchards; Steve Smith of Red Gold, Inc.; Mary McConnell of the Nature Conservancy; Amy Kelsay of Kelsay Farms; and John Hardin of Hardin Farms, all talk about how Purdue Agriculture makes a difference for them and their organizations is very uplifting stuff. One of our new faculty members, Ian Kaplan, was recently in Washington, D.C. where he received the Presidential Early Career Award for Scientists and Engineers from President Obama. Ian received one of the 96 awards made nationally. Read more on this honor below. Ian’s work in ecological approaches to pest management for vegetable crops is drawing national recognition. Congratulations Ian! There have been major changes to the Purdue Extension presence at the Indiana State Fair. We are now part of the DuPont Food Pavilion, and our Agricultural Communication design shop partnered with our Extension colleagues in the College of Health and Human Sciences to develop a wonderful exhibit focused on food choices and nutrition. I hope you'll consider making a trip to the Indiana State Fair – it is truly a celebration of Indiana agriculture and our Indiana youth. Thanks to everyone from Purdue Agriculture and Purdue Extension who has played a role at the Indiana State Fair! We were notified this summer that our faculty cluster hire proposal with the College of Veterinary Medicine focused on animal welfare science was funded by the provost's office. We are now working on the searches for this cluster hire. In addition to this successful proposal, we are also partners on the epigenetics/chromatin biology cluster hire and the systems and computational biology cluster hire – three of the total of six funded. Thanks to Associate Dean Karen Plaut, Head of Biochemistry Clint Chapple, Harm Hogenesch (associate dean in the College of Veterinary Medicine) and everyone involved in these successful proposals. Our President-elect has begun spending time on campus (as his day job allows!). He has focused his attention on the administrative functions of the campus to this point, since most faculty and our students are not around. Once the faculty and students have come back, he will be meeting with as many as his schedule allows. Governor Daniels will be visiting each College soon, and we will make sure his visit is promoted widely so you can have the opportunity to meet him. As you know, our Associate Dean and Extension Director Chuck Hibberd will be leaving us for the University of Nebraska-Lincoln on October 1 (more below). We will certainly miss Chuck and his leadership – he has been a real difference maker in Indiana. I wish him much continued success in his new role – Nebraska is getting someone special. We will be celebrating Chuck’s leadership soon and will let you know as soon as we have the arrangements set. We will be welcoming more than 500 new undergraduate students to our College very soon – a class that is larger and even better prepared academically than last year’s class (plus a great group of new graduate students as well). I had the opportunity to meet three of our incoming students at a 4-H leadership event at the State Fair last week. Bright, excited, enthusiastic – they could not wait to join our College and become Boilermakers! We have much on our agenda this fall in Academic Programs––addressing the 120 credit cap, the core curriculum, the Honors College, etc. Even with all that, I know we will continue to deliver an exceptional undergraduate experience for students such as those I met at the Indiana State Fair. For those of you who have been away this summer, welcome back! I wish everyone in Purdue Agriculture an exciting and rewarding academic year. Associate Dean and Director of Extension Chuck Hibberd will leave Purdue to become Dean and Director of Extension at the University of Nebraska-Lincoln on October 1. Chuck came to Purdue in 2007 from the University of Nebraska, where he had been district director of the Panhandle Research and Extension Center. Said Dean Jay Akridge, "Chuck has done an exceptional job leading Purdue Extension over the past five years and will be sorely missed. Purdue Extension is recognized nationally for innovation and impact and Chuck’s inspiring leadership has been a true catalyst. He has made a major contribution to 'transforming lives and livelihoods' in this state in his role as Director of Extension." Dean Akridge is assembling a search committee that will conduct an aggressive national search for the very best leader to help take our exceptional Extension program to even higher levels of service to our state, nation and world. Our very best wishes go with Chuck and Janel as they head back to Nebraska in the fall. Marshall Porterfield, professor of agricultural and biological engineering and biomedical engineering, will become director of NASA's Space Life and Physical Sciences Research and Applications Division for the next two to three years. Porterfield will take a leave of absence from Purdue, though he will remain a tenured professor and his research programs will continue. He plans to return to campus every few weeks to work with graduate students. One week this summer, Purdue University senior David Wilson was sweating bullets onto the dirt floor of a toolshed in Cameroon, Africa, hack-sawing his way through a piece of angle iron. The next week, he was surrounded by million-dollar machines in the climate-controlled environs of a Lafayette, Ind., manufacturing operation, completing a summer internship. Within the course of a few weeks, the agricultural and biological engineering student learned that good engineering can happen anywhere. Wilson was among Purdue students and faculty who traveled to Cameroon this summer to help a team of Africans build a basic utility vehicle, or BUV, that would not only carry people and produce from place to place but also perform tasks such as pumping water from wells in undeveloped African villages. Through September 12, MESA (Multicultural Efforts to end Sexual Assault) is seeking donations to assist in our violence prevention outreach efforts with Migrant Farm Worker families. Migrant farm workers are among the poorest families in the United States. These workers and their families travel each year to Indiana to help plant and harvest crops to bring food to our tables. Many of these families arrive with no money and only one change of clothes. Sixteen new Agriculture faculty and staff joined Dean Jay Akridge and Associate Deans Marcos Fernandez, Chuck Hibberd and Karen Plaut for the 2012 New Faculty Tour on August 8 and 9. Each year we take our newer faculty members on a tour of a region of Indiana to become more familiar with its food, agriculture and natural resource systems. It is a great opportunity for our new faculty to connect with some of our alumni and stakeholders around the state and learn about the breadth of Indiana agriculture and agribusiness. This year's tour covered Central Indiana, including a stop at the farm of Purdue Trustee and Agriculture alum John Hardin, where the group posed beside one of his tractors. This is a birthday party that has been 100 years in the making. So it only makes sense that it should take more than one day to adequately celebrate the centennial of Purdue University's Department of Entomology. Entomology will officially celebrate its 100th birthday Oct. 12-13 as part of Purdue's Homecoming weekend festivities. The department will kick off a school-year-long recognition program Aug. 23. "We have lined up a list of guest speakers not only from Purdue, but also from across the nation to help us celebrate our centennial," said department head Steve Yaninek. "Our Centennial Lecture Series will run every Thursday from Aug. 23 through the end of April 2013 and feature nationally acclaimed scientists, distinguished alumni and some special stakeholder partners." 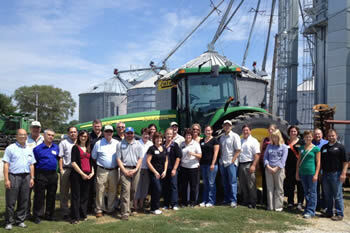 This marks the seventh year for the Hoosier Agribusiness and Science Academy (HASA). The program, run by the College of Agriculture Office of Multicultural Programs, offers educational opportunities to first generation college and urban students to learn about the world of agriculture and receive first-hand experience. Purdue has been a partner with the HASA program for several years. Every summer, the students are housed on the campus for a two-week college experience. 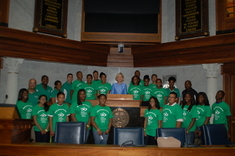 During the institute, the students visit the statehouse to learn about state government and its role in agriculture. "HASA has proven that agriculture is a statewide endeavor, and giving urban students the tools to learn the industry has provided many success stories for our students," says Lt. Governor Skillman. "Many students who graduate from HASA are often the first in their family to attend college. I look forward to seeing the continued growth of our students in the HASA program." Nominations are now being accepted for this year's Frederick L. Hovde Award of Excellence, given annually to a member of the Purdue faculty or staff with an outstanding record of educational service to rural Indiana. Any active member of the faculty or staff is eligible for nomination. A person's contributions may have been in the classroom, in counseling, in research or through Extension. Details about the award and how to nominate are available by contacting Becky Rice by email at rdr@purdue.edu or by phone at 49-45456. Nomination deadline is Sept. 14. Nominations must be submitted to Rice by email or by fax at 765-494-7420. The recipient, to be selected by a university committee, will receive a cash prize of $800 and a plaque. The winner's name also will be added to a permanent display in the Agricultural Administration Building. Ian Kaplan, Entomology, was one of two Purdue University researchers selected to receive Presidential Early Career awards for Scientists and Engineers. Ian and Alice Pawley, assistant professor in engineering education, were among 96 recipients of the award--also known as PECASE--which is the highest honor bestowed by the U.S. government on science and engineering professionals in the early stages of their independent research careers. The honors were given during a July 31 ceremony in Washington, D.C.
Cary Mitchell, Horticulture and Landscape Architecture, received the 2012 Jeffries Aerospace Medicine and Life Science Research Award of the American Institute of Aeronautics and Astronautics for his contributions to space life sciences through ground-based research and project leadership. He received the award on July 18 banquet at the 42nd International Conference on Environmental Systems in San Diego. Mitchell's research has led to a new understanding of biogenerative life support systems, plant production, and the key enabling technology of light-emitting diodes, or LEDs. His work has been used to lower the mass and power required to govern plant production and closed environment agriculture systems for both space and terrestrial applications. Emilie Kuhn (top) and Amanda Workman (bottom), both seniors in agricultural education, were awarded NAAE Upper Division Scholarships for 2012. The NAAE (National Association of Agricultural Educators) is a federation of state agricultural educators associations with more than 7,650 members. Each scholarship winner will receive a $750 award to be used for expenses they occur while student teaching. The U.S. Department of Agriculture's outlook for the nation's corn and soybean harvests reflects what farmers have been seeing for the past two months: vanishing prospects for a good year as their crops wilt from lack of water. The USDA's August crop production report, the first projections of how much corn, soybean and other crops are expected to produce this year, paints a bleak picture as Indiana and other eastern Corn Belt states suffer through the worst drought since at least 1988. In the report, released Friday (Aug. 10), USDA estimated Indiana's corn crop would produce 605 million bushels on yields averaging about 100 bushels per acre, a per-acre decrease of 46 bushels from 2011 and 57.4 bushels from Indiana's five-year average. Soybeans are projected to yield 37 bushels per acre, down 8 bushels from last year and 9.7 bushels from the five-year average. Although parts of Indiana got a good drenching over the past week, a longer trend of significant rainfall is needed before the U.S. Drought Monitor shows a reversal of dryness that has been intensifying since the spring. The Drought Monitor (http://droughtmonitor.unl.edu/DM_state.htm?IN,MW) update of August 9 showed very minor improvement in drought conditions in extreme east-central Indiana. Most of the state remains in extreme or exceptional drought - the two highest levels. That is despite rain of at least 3 inches in some areas, especially the southwest, and lesser amounts in the north. "The Drought Monitor is unlikely to show lessening of drought based on only a week of decent precipitation," said Ken Scheeringa, associate state climatologist based at Purdue University. So even though heavier rain has started to fall, evaporation and runoff will immediately take away some of this new moisture. Purdue Extension is scheduling a series of regional meetings across Indiana to help crop and livestock producers manage their way through the financial and operational consequences of the drought. The meetings being held at locations throughout the state enable Extension specialists and other agricultural experts to help farmers by providing information about situations they face in their area. "Drought conditions vary around the state, so we can plan meetings that address the big questions that farmers have right now," said Jim Mintert, assistant director of Purdue Extension. Producers can check with their local county Extension office for the closest meeting to them. Meetings also are being added to Purdue Extension's Drought Event Calendar at https://ag.purdue.edu/extension/eden/pages/drought.aspx#calendar as they are planned. Indiana State Fair visitors of all ages get a full serving of helpful, practical advice on how to plan healthy meals when they go through a new Purdue Extension exhibit. The interactive exhibit in the DuPont Food Pavilion is one of a variety of Extension exhibits and activities during the fair. 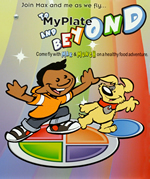 The new exhibit "To MyPlate and Beyond" illustrates the U.S. Department of Agriculture's tool that emphasizes the five food groups that are part of a healthy diet: fruits, vegetables, grains, proteins and dairy. "Visitors will learn how easy it is to shop for food, grow their own, plan meals and eat together," said Lisa Graves, Extension specialist in the College of Health and Human Sciences' Department of Nutrition Science. "From child to adult, the exhibit will feature tips and ideas for everyone to build a healthy plate." A Purdue Extension workshop will focus largely on helping forage and livestock producers manage the 2012 drought. The Forage Management Workshop is 8:30 a.m. to 4 p.m. Sept. 6 at the Purdue Agronomy Center for Research and Education, 4540 U.S. 52, West Lafayette. The annual workshop typically focuses on general forage management topics, but organizers made a shift in this year's program to account for the extreme heat and drought plaguing Indiana. "There will be several drought highlights, including presentations about seeding emergency crops, alternative livestock feeds, double crop forages and silage," said Keith Johnson, Purdue Extension forage specialist. It will cover a variety of management practices for droughty pastures, alternative feeds, damaged forage stands and soil cover. The drought likely will temporarily alter movement patterns and habitat selection of some Indiana wildlife unable to find food, water and shelter as the resources of their natural environments dwindle, Purdue University wildlife experts say. Although the impact of the drought on wildlife is unknown at this time, Purdue Extension wildlife specialist Brian MacGowan does not expect lasting effects. "Most of the things that we will see this year are going to have short-term implications," MacGowan said. "Typically, nature rebounds as long as bad years of weather are followed by good years. However, if the drought resulted in reduced food availability, that will likely result in lower survival of young and weak animals and lower reproduction next year. Good weather next year, however, can lead to a good reproductive year that can offset losses from this year." Reuben Goforth, assistant professor of aquatic ecosystems, is pictured with shells of freshwater clams on a sandbar in the Wabash River just north of West Lafayette. He says a combination of high temperatures and low water levels cause the clams to overheat and die. Once the clams are exposed to the elements, birds and other foraging animals pick the shells clean. For the first time, an Indiana winery took top honors at the Indy International Wine Competition, which took place August 1-3 at Purdue University. River City Winery of New Albany was awarded Wine of Year for its 2011 Vignoles. The entry was among nearly 2,400 wines from 41 states and 14 countries competing in the annual event. The competition is run by the Indiana Wine Grape Council. Indiana's hay crop is struggling to weather the drought, leaving livestock producers to search for alternative feedstuffs for their herds and flocks. The state's alfalfa crop, while high in quality, is low in quantity after a spring freeze reduced the first cutting and drought reduced subsequent cuttings. Drought also has wreaked havoc on other grass hay sources and pastures. "This definitely is a problematic year and scenario," said Keith Johnson, Purdue Extension forage specialist. "The hay yield certainly is depressed. I wouldn't be surprised if the yields were off by 50 percent for some producers." In a more normal year, and with proper management, Indiana alfalfa producers could have as many as five cuttings. This year's crop likely will only be harvested three times in many regions of the state. Purdue administrators reiterated the importance of reporting sexual abuse and outlined protocol in place for university employees. Acting President Timothy Sands, Athletics Director Morgan Burke, and Vice President for Ethics and Compliance Alysa Rollock spoke on July 23, the same day the NCAA released penalties imposed on Penn State due to its sexual abuse scandal and subsequent handling of the matter as detailed in the Freeh Report. "I think everybody has a very similar reaction," Sands said. "Your thoughts immediately go to the children, the young individuals who were the real victims. I think everybody is still focused on the victims. We haven’t heard the end of that, and they are not out of our minds." Sands said the university is reviewing the Freeh Report and its recommendations to learn from the Penn State incident. Purdue administrators outlined protocol in place to handle the reporting of suspected child and sexual abuse. As you know, this summer has been a difficult hot and dry one that posed serious health and fire safety concerns. As we enter the 2012-2013 fall semester, we remind you to remain vigilant and keep safety and security precautions in mind. We appreciate your efforts to remain observant and prepared in regards to natural disaster and incident response. September is National Preparedness Month, and Purdue will offer a Safety Day again this year. Once it is announced, please publicize it with your students and colleagues. Obviously, the goal is for all of us to be prepared for emergencies to the fullest extent possible. Therefore, we also ask you to make an effort to promote safety with your students. The information in the link below includes several steps we urge you to take routinely as preparation for the potential of a campus emergency. In addition, we have added a list of short safety video resources that you can utilize should you have a few minutes of class time available. They are interesting and memorable ways to teach good safety practices and prepare for potential campus or individual emergencies. The Trask Innovation Fund (TIF) awarded nearly $200,000 to Purdue researchers studying alternative fuels, pharmaceutical drug dosage forms, assisted reproductive technology and a mobile app for note-taking in the most recent round of awards through the Trask Innovation Fund. The Purdue Research Foundation-managed Trask Innovation Fund is a development program to assist faculty whose discoveries are being commercialized through the Purdue Office of Technology Commercialization. "The Trask Innovation Fund provides Purdue researchers with funding to assist in the process of commercializing a discovery," said Joseph B. Hornett, senior vice president, treasurer and COO of the Purdue Research Foundation. "The awards can be used to prove a concept, develop prototypes, marketing research and advisement, and other necessary resources to help move a discovery into the market." Cats and dogs will help give lessons in animal health, including the benefits of spaying and neutering, during the Indiana State Fair. For the 28th year, the Purdue University College of Veterinary Medicine is working with the Indiana Veterinary Medical Association to demonstrate surgical procedures daily during the fair, which runs through Aug. 19 in Indianapolis. The surgeries will be in a new location this year, the Ag/Hort Pavilion. The spaying and neutering surgeries are done in a glass-enclosed operating room that allows fairgoers to watch from seats outside. Overhead cameras in the room feed outside monitors that give observers an up-close view.